To red cup, or not red cup that is the question! Have you been following the latest “controversy” surrounding the cups at Starbucks? Before I go any further,let me say if the biggest concern you have is over what’s written on the side of your overpriced coffee cup, you don’t really have any problems. 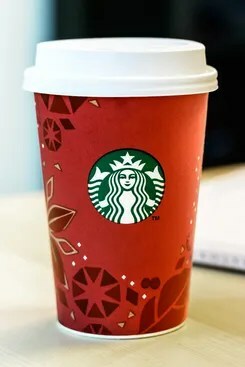 But that being said, I guess Starbucks is no longer having the word Christmas on their seasonal red cups. For some reason people are upset that Starbucks has “taken the Christ” of Christmas. I’m not exactly sure why we should be surprised by this, I don’t know who was under the presumption that Starbucks was a Christian business. Be that as it may, many Christians are letting Starbucks know they aren’t going to sip their latte’s lying down. They are taking a stand against such an egregious mistake as removing references to Christ during Christmas. Many are boycotting Starbucks until after the holiday, because, well you can’t do without your Chai all year. Principles are one thing, but you have to have perspective. Others are going so far as to tell the barista that their name is “Merry Christmas (or if you are female you can get by with Mary Christmas) to force them to put Merry Christmas on their holiday cups. I’m all for Christmas. And I do, in all seriousness, wonder what non believers actually are celebrating at Christmas if it’s not Jesus? If It’s not Him, what are we celebrating that has any true significance? And no I don’t like the over commercialization. I don’t like the fact that schools no longer have Christmas break and seem to go out of their way to even recognize Christmas is happening. But at the same time I wonder if not only are we, in the case of the red cups, making a mountain out of a molehill, but if we aren’t going about the whole issue in the wrong way. Perhaps expecting secular groups to keep Christ in Christmas is the wrong path to take. Rather we ought to ask ourselves, as Christians, how do we keep Christ in Christmas? Isn’t it by keeping Christ in ourselves and in every action? Forcing that barista to write Merry Christmas on a cup probably isn’t going to change her life. But giving her a larger tip and telling her it’s because it’s Christmas might. Taking an active interest in who she is, like Jesus would, and waiting for the Holy Spirit to give you an opening to witness probably would. Inviting her to Christmas Eve services would. Do you want to keep Christ in Christmas (nd in Starbucks?) Try being more like Jesus and less grouchy and impatient this year when you are in line. Stop rolling your eyes at that person who isn’t dressed like you are and sporting a few extra piercings. Instead of getting irritated when the person in front of you is taking too long to order, use that time to pray for everyone in line. You want to keep Christ in Christmas? Order two coffees and give one to that person huddled outside who is cold and perhaps without a job. If we want to keep Christ in Christmas we might just want to start doing a better job of keeping him in ourselves. Brian. If I wasn’t already so grateful to our lLord for sending you to us, I would be for your comments on this subject, Before this blunder, I didn’t have anything against. Starbucks (except price – I can buy a whole can for less than a cup – but to each their own). However, I refuse to do business (meaning I will not spend my money at a company who refuses my right to keep Christ in Christmas. This might be a good time for me to recall that a number of years ago, I had forgotten to get a particular present. So I rushed out about 3 hours before closing on Christmas eve. I saw no smiles a good amount of grumbling and a lot of short nerves. It suddenly struck me that the majority of those people were there for the same reason I was. We were there because we all loved someone and didn’t want to disappoint someone. That insight changed my outlook and attitude for late shoppers forever. The crowds are still a little unsettling. But that afternoon I began smiling, humming Christmas tunes, and stepping aside to let someone with fewer purchases to go ahead of me. I sincerely thanked the cashier and wished everyone around me a truly Merry Christmas. I couldn’t believe how many people actually thanked me for altering their outlook. If I was there because I loved someone, so were most of the other people. I figured how nice that so many people loved someone so much that they’d go thru those crowds. That’s a lot of love. And I’d far rather concentrate on that.